Once again this looks to be the best division in the game and also the most difficult to predict. The expected finish of the top three here is basically a dice roll. You can make a great argument for any one of them winning the division (heck, all three are good World Series picks). At the same time, whichever two teams among the Rays, Yankees, and Red Sox don't win the division will be left to compete with the powerhouse Rangers and Angels for two Wild Card spots. Needless to say, the American League will be a lot of fun this year. 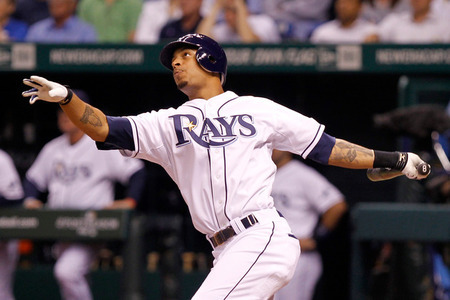 There is something very special about this Rays team and, no, I'm not talking about their magical finish last year. This organization has developed and stockpiled talent for years now, yet they've always been very conservative about bringing their young prospects up to the majors lest they have to pay them too much money too soon. This was exemplified last year by the late arrivals of Desmond Jennings and Matt Moore, two players who were clearly ready to come up to the pros last season but were kept in the minors for most of the year. It seemed as though the Rays were punting away their season by handicapping themselves this way, but once they finally brought Jennings and Moore to the bigs, both guys performed so well down the stretch that they helped propel the team to its miracle comeback in the standings. This year, the Rays are all in. Nobody's stuck in the minors. The team is built to win right now. And they might be scary good. They've already had one of the best defenses in baseball for years, they are adding flame-throwing lefty strikeout machine Moore to a rotation that was already excellent (so good, in fact, that a quality starter is being sent to the pen), and they'll have a full season of a 25-year-old Jennings who could conceivably go for 20 homers and 40 steals. If he can manage to stay healthy for a full season, resident superstar Evan Longoria is an easy MVP pick and they've still got Ben Zobrist, one of the most versatile and productive players in baseball. There's a lot to like about this team and I'm officially on the bandwagon. 95 wins and a World Series victory. Despite an epic collapse last year, the Red Sox are still loaded. PECOTA has them scoring the second-most runs in the majors (right behind the Yankees) and if they can just manage to keep a few of their pitchers healthy over the long haul, they'll be right in the middle of the melee in the AL between the Rays, Yanks, Rangers, and Angels. No other team in baseball can expect to have three of the top 10 position players in the game as the Red Sox do with Adrian Gonzalez, Dustin Pedroia and Jacoby Ellsbury. I'm excited to see what Bobby Valentine does for this team. The impact of a manager is a heavily debated topic, but the change from the calm and good-natured Francona to the fastidious and excitable Valentine should produce some obvious results for a team that's had a reputation for slow, deliberate (some might say lazy) play. I've got them finishing behind the Rays but it wouldn't surprise me if they burst out of the gate and run amok with a full-season performance that comes close to their historic dominance through the heart of last summer. As a dedicated detractor of the Yankees, I can honestly say that this year's team scares the crap out of me. Their one weakness the last few years has been starting pitching and now suddenly they've got an incredilby deep rotation with seven viable major league starters, including the returning-from-retirement fan-favorite Andy Pettite. Backing up that staff is perhaps baseball's toughest bullpen. Be very afraid. If Yankee haters can take solace in anything, it's that the core of the team is undoubtedly declining despite the fact that a conservative projection system like PECOTA still picks them to finish first in both wins and runs scored. Derek Jeter is almost 38 years old, declining and has been a horrific defender for years. He's seen better days at the plate, too. Curtis Granderson, while establishing a new level of performance last year with 41 homers, is on the wrong side of 30 and a good candidate for regression. And A-Rod is 36 and hasn't played a full season in five years. Eh, who am I kidding. They'll be great. The only thing that might hold them back will be the inevitable nagging injuries suffered by their elder statesmen, but even if they have to rely on a bunch of replacement hitters in the lineup this pitching staff will be good enough to get them to 90 wins. I think they'll finish around that mark, but (with lots of subjective hope sprinkled into this assertion) outside the playoff picture. The American League seems to be cleanly split into two sectors: the contenders (Angels/Rangers/Tigers/Red Sox/Rays/Yanks) and everybody else. The Blue Jays represent the best shot for the "everybody else" crew. Having hovered on the periphery of the competitive pack for almost a decade now, their current combination of one of the best hitters in the game, plenty of young talent, a smart front office, and deep-pocketed owners could easily lead them into the postseason Promised Land this season. Sophomore Brett Lawrie is a boisterous beast. He's sure to polarize fans while pulverizing pitchers. RHP Brandon Morrow is a confounding riddle of a pitcher who could easily unfold into a Cy Young winner. His repertoire is pure filth, it struck out more than 10 batters per nine innings each of the last two years and he's still 27 years of age. They've got quality young players all over the roster but they'll need a few breakout performances to get over the hump and into the playoff mix. Barring major injuries to the big boys atop the division, I don't think they'll get too far past the break-even mark. The Good News: It certainly bodes well for them that PECOTA projects 75 wins. They haven't won that many games in eight years. Also, Matt Wieters might start being great really soon.